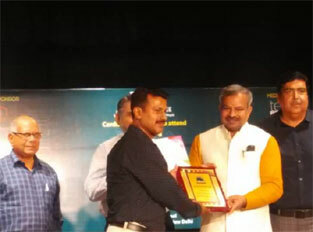 Mr. T. P. Aggarwal, our school Chairman was bestowed upon the prestigious HARYANA GAURAV AWARD by the CM of Haryana, Shri. 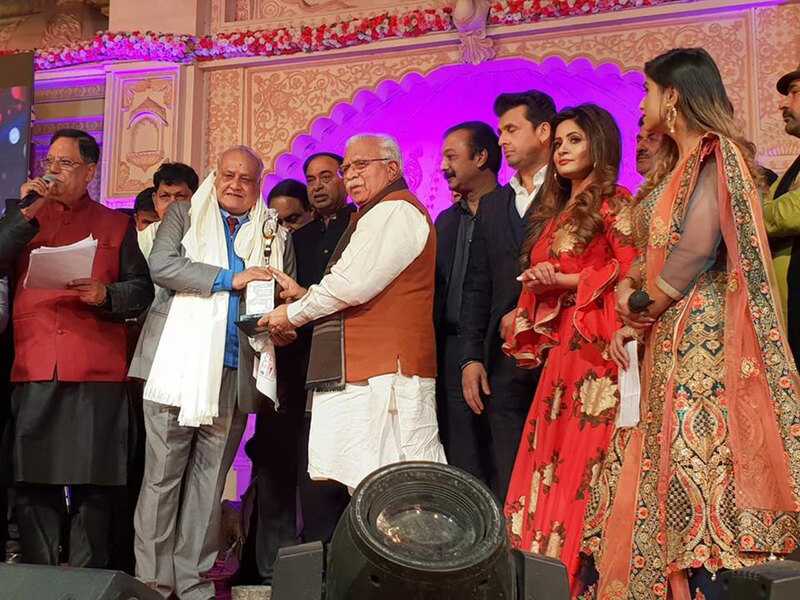 Manohar Khatter, at a ceremony held at Karnal, Haryana. Today, on our school's 44th Foundation Day, we rejoice with happiness and are immensely proud of the remarkable journey started with the blessings of our beloved and honourable Founder Chairman, Mr. Aggarwal. CONGRATULATIONS from the entire SMS family. 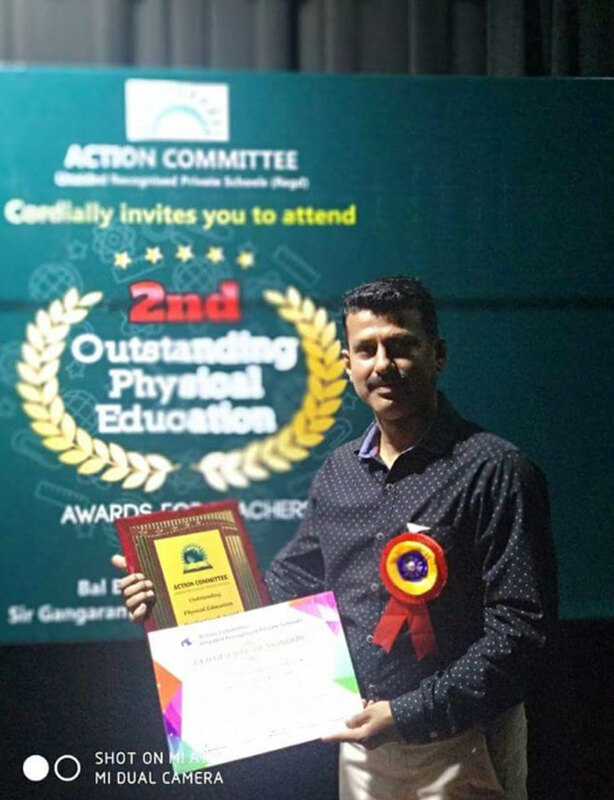 The 2nd Outstanding Physical Education Coach Award 2018 for teachers under the ageis of Action Committee, Unaided Recognized Private Schools, felicitated Mr. Girish Bahuguna, our senior physical education teacher with the prestigious award at a ceremony. "It is said that if your actions inspire others to dream more, learn more, do more, and become more, you are a leader." 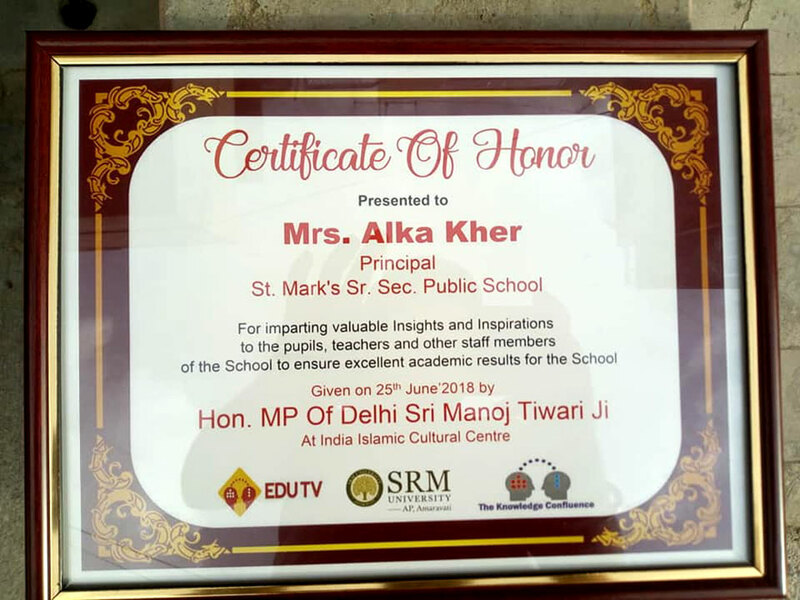 We are immensely proud of our school Principal, Mrs. Alka Kher as she is a true leader. 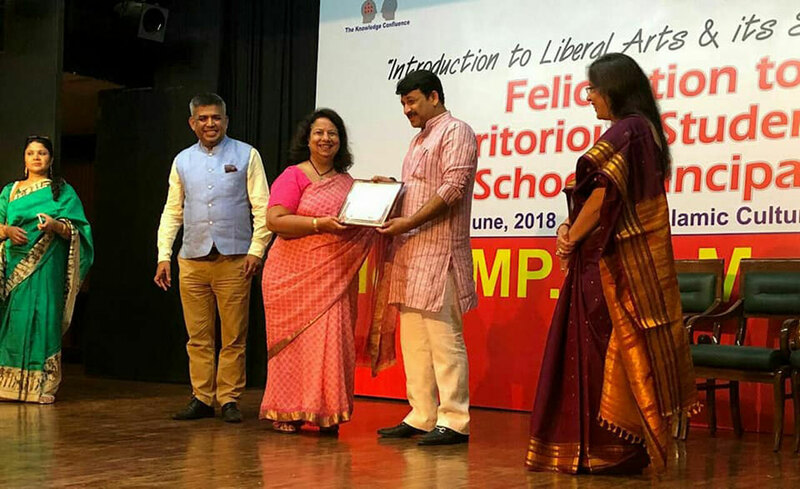 Her dedicated work ensures academic excellence by her valuable insights as it instills great confidence in students, teachers and staff to give their best. 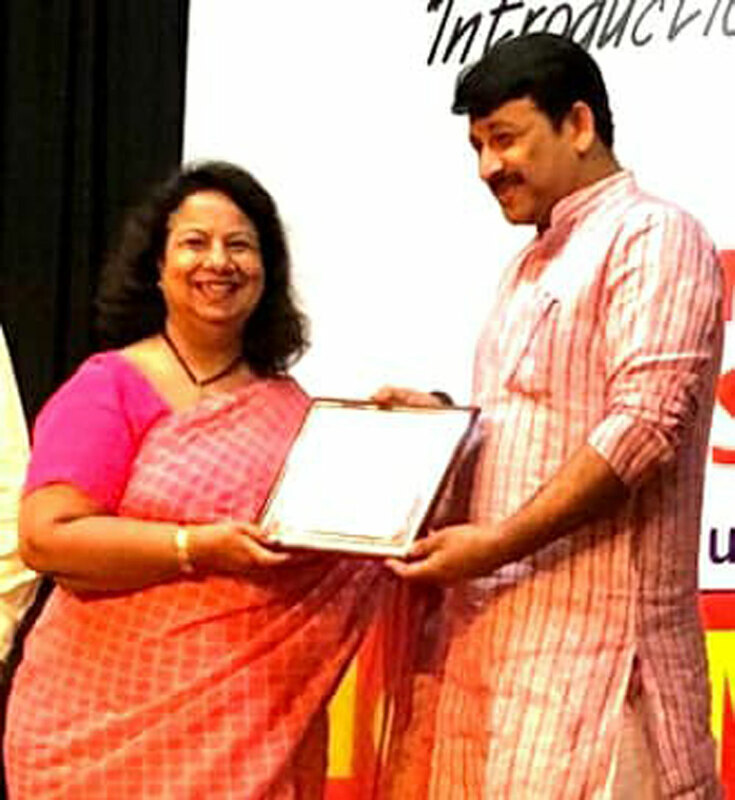 In a Felicitation function, held recently at All India Islamic Cultural Center, Hon. MP of Delhi, Sri. 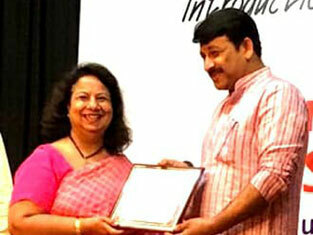 Manoj Tiwari Ji presented Certificate of Honor to Mrs. Alka Kher. A very proud moment for us indeed ! This contest is supported and sponsored by Give Something Back International (GSBI), Dallas, USA. The students from all the schools exhibited creativity, collaboration and innovative use of technology in their work to build up an outstanding website on the theme ‘OUR VISION OF PEACE’. The team has been awarded Monetary Award Cheque and one year scholarship to educate a disadvantaged student for their outstanding accomplishments. 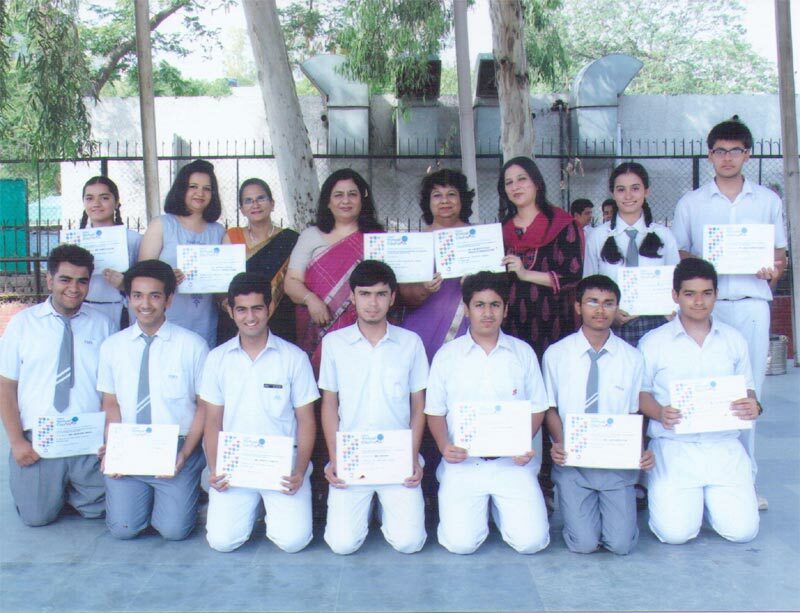 All the participants and the teacher coordinator were awarded with a Gold Award Certificate and a letter of appreciation for the teacher coordinator Ms. Monika Uppal. Ritika Arya XII-A of 2017- 18. Yoga and Naturopathy Summit 2018 was organized by School of Ayush Studies and Research Confederation of Indian Universities. The Search Committee certified and endorsed the contribution of our school for giving emphasis on yogic and naturopathic awareness among the students as well as teachers of the school. 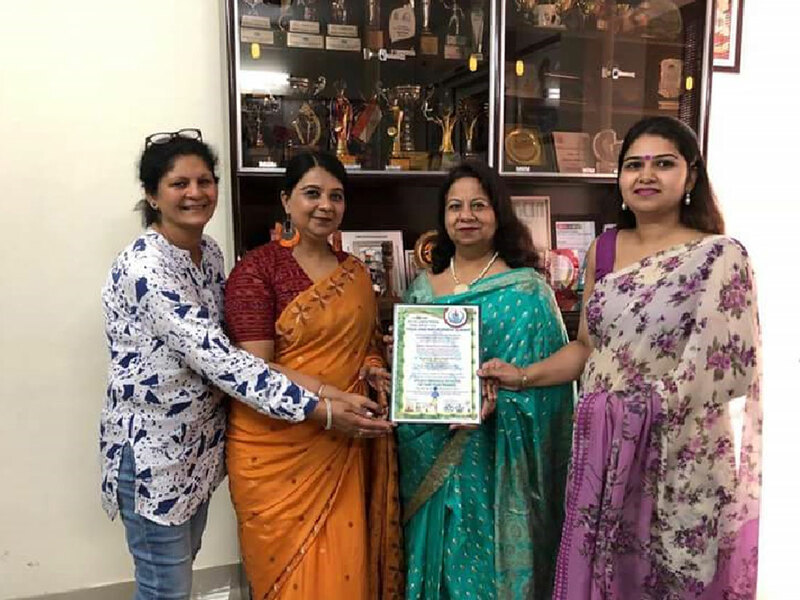 In the area of yoga, naturopathy and related therapies, "Ayush Friendly School of the Year Award" was conferred to Principal, Ms. Alka Kher, Headmistress Ms. Inderpreet Ahluwalia, Primary Educational Supervisor Ms. Jyotsna Vishwakarma and PET Ms. Manju Wadhwa. 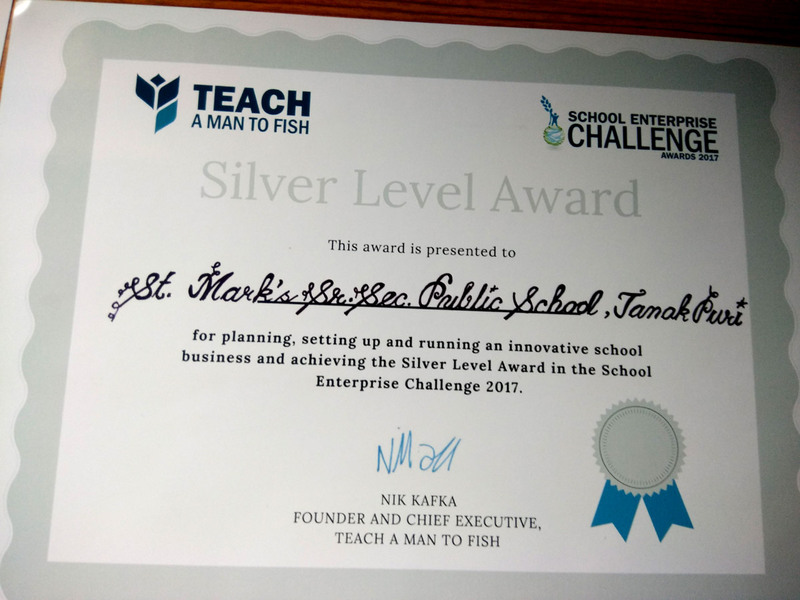 ‘Eco Threads’ Venture of SMS, Janakpuri achieved Silver Level Award for planning, setting up and running an innovative school business in the School Enterprise Challenge 2017. 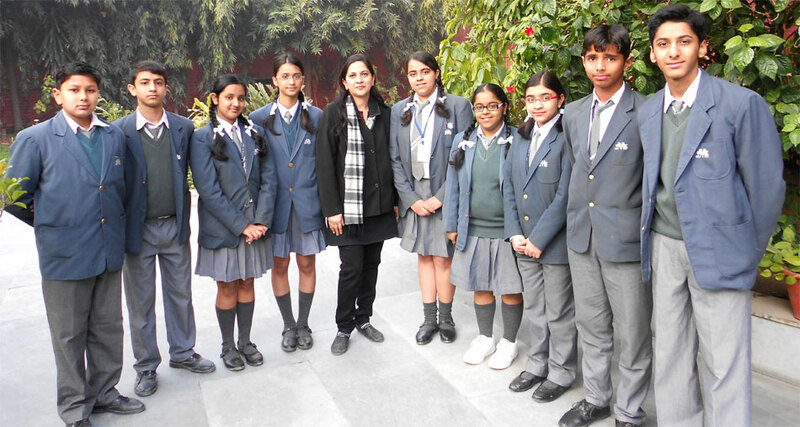 The young enthusiastic entrepreneurs of St. Mark’s Sr. Sec. 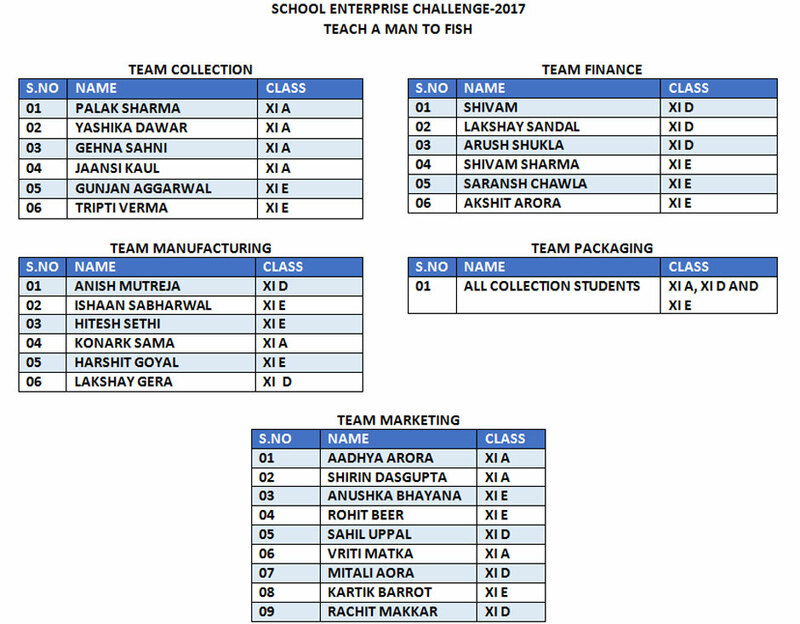 Public School, Janakpuri of grade XI comprising of 27 students headed by their team leader Ms. Shirin Das Gupta were a part of School Enterprise Challenge 2017. The students weresegregated into various departments viz. 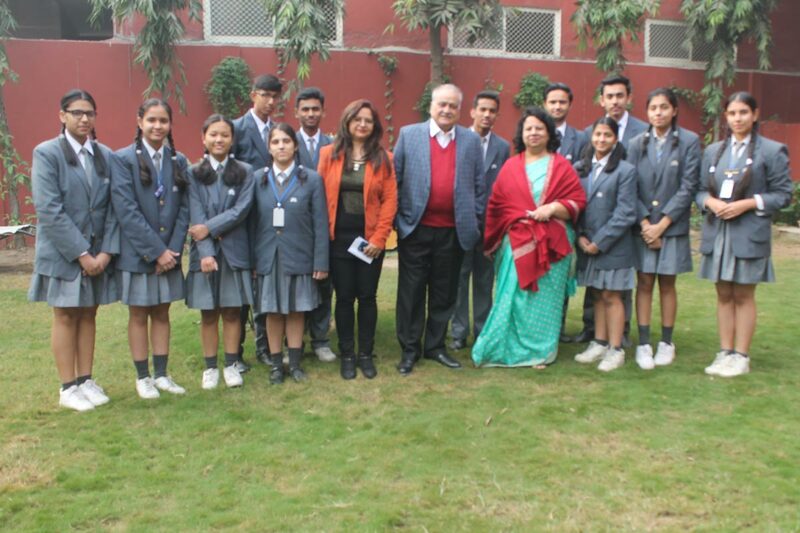 Collection headed by Yashika Dawar, Finance headed by Shivam Sharma, Manufacturing was headed by Palak Sharma, Packaging was headed by Gehna Sahani and Marketing was headed by Sahil Uppal. The SMS Venture 'ECO THREADS’ recycled stitched clothes into beautiful cushion covers, table mats and fashionable college bags. 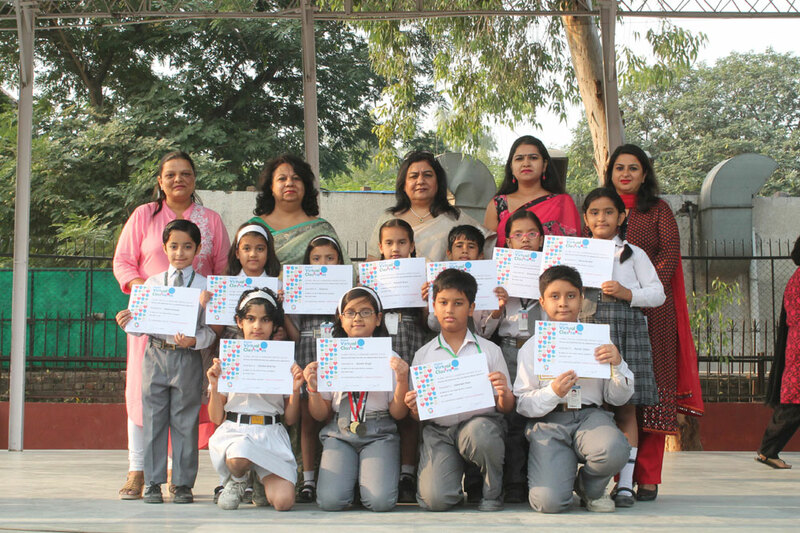 All the participating students, Principal Ms. Alka Kher, Primary Educational Supervisor Ms. Jyotsna Vishwakarma, Lead Teacher Ms. Monika Uppal and the teacher coordinators Ms. Shubham Arora and Ms. Nidhi Johari were also awarded with the Silver Level Award Certificate. 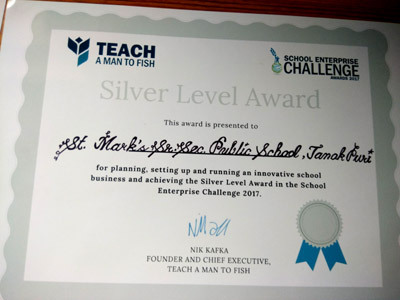 The school was also awarded with a School Enterprise Challenge Award Badge to be used on all social media and school website to show our great achievement. A special felicitation ceremony was held on 15 December 2017 for contribution towards establishment of a Seed Bank as well as engaging in various workshops and activities under Project Ankur. 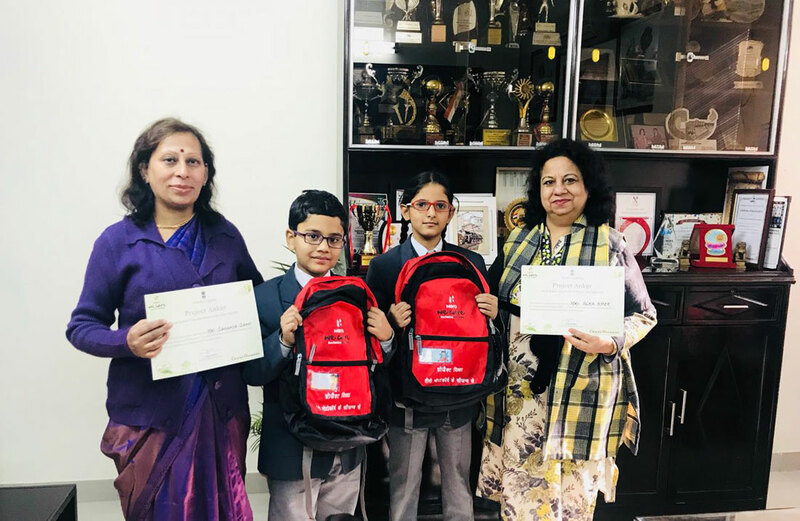 Our principal Mrs. Alka Kher and teacher coordinator Mrs. Sandhya Sahni received the certificate of appreciation and a memento from Director, Directorate of Education, Government of NCT Delhi and Mr. Vijay Sethi CIO and Head CSR, Hero Motocorp. 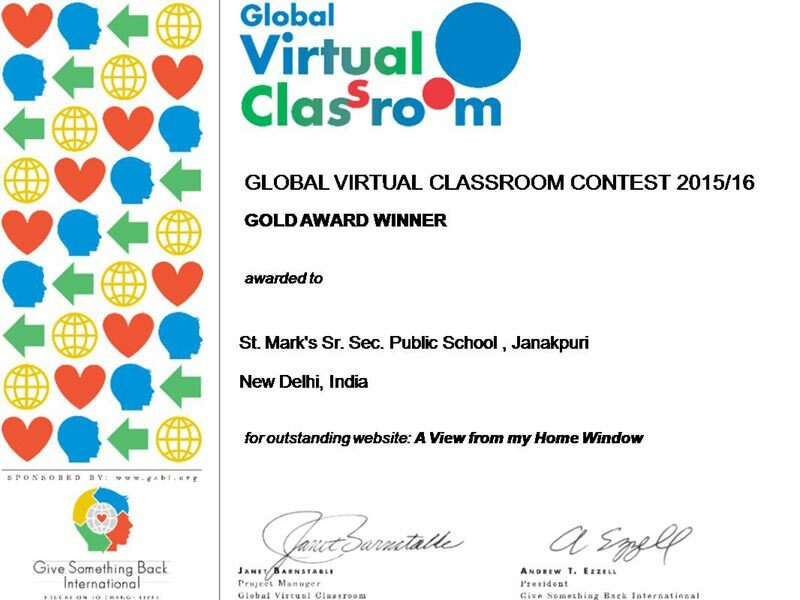 Divjot and Raghav of Class V being a part of the project were also presented memento. For the second time in a row, St. Mark’s Sr. Sec. Public School, Janakpuri was accredited with the ‘British Council School Award’ for the period of 2017 – 2020. Throughout the academic year 2016-2017, the whole school was enthusiastically involved in the seven ISA Projects. 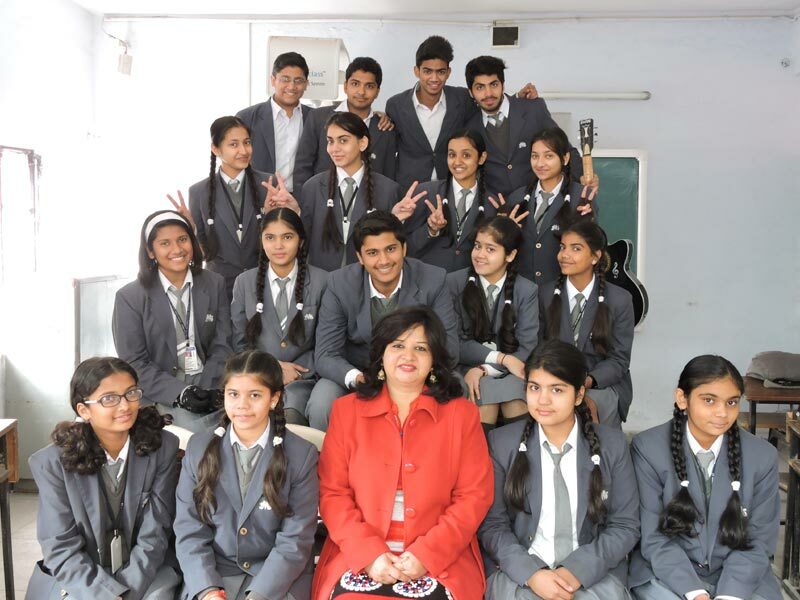 The programme enabled the students to collaborate with their peers around the world and work with school leaders and teachers to inculcate a global dimension and global citizenship in education practice and policy. 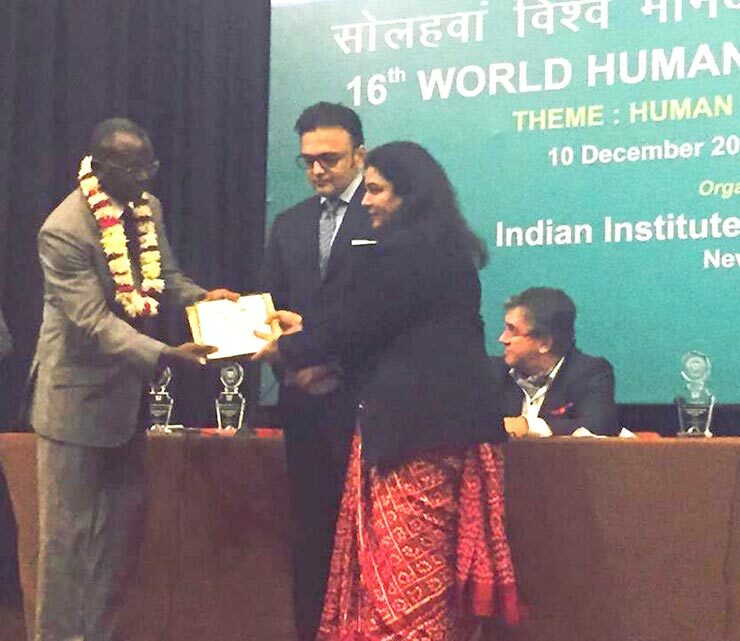 Our Principal, Ms. Alka Kher was conferred the Global Human Rights Protection Award during the 18th World Human Rights Congress on 10 December 2017. The event was organised by Institute of Human Rights at India International Centre, on the occasion of Human Rights Day. The awardee was selected for her contribution towards Human Rights Education, and for promoting the culture of respect for Human Rights amongst students. 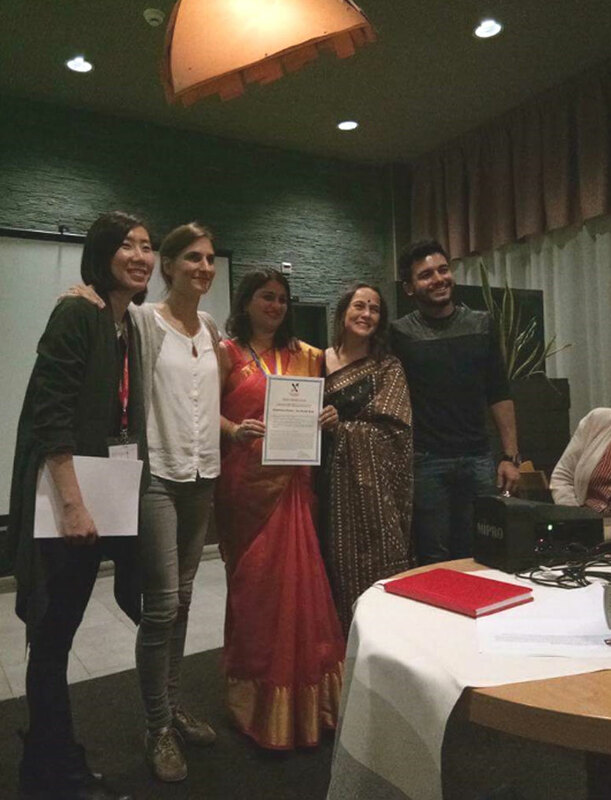 Grandma's Kitchen, an Online Collaborative Project of students from 33 schools from 22 countries of Asia and Europe, our school project had qualified for being considered for Awards, and Ms. Ritu Khurana, Project Coordinator, attended the 13th ASEF Classroom Network Conference in Zug, Switzerland from 8-11 September for the Award Ceremony. 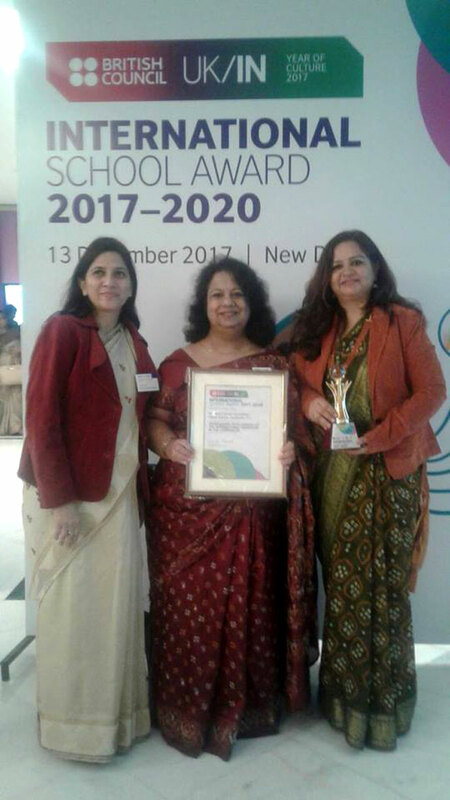 Our school project won the Gold Award, and Ms. Ritu Khurana received the Award on behalf of our School at the Award Ceremony held on 10 September 2017. 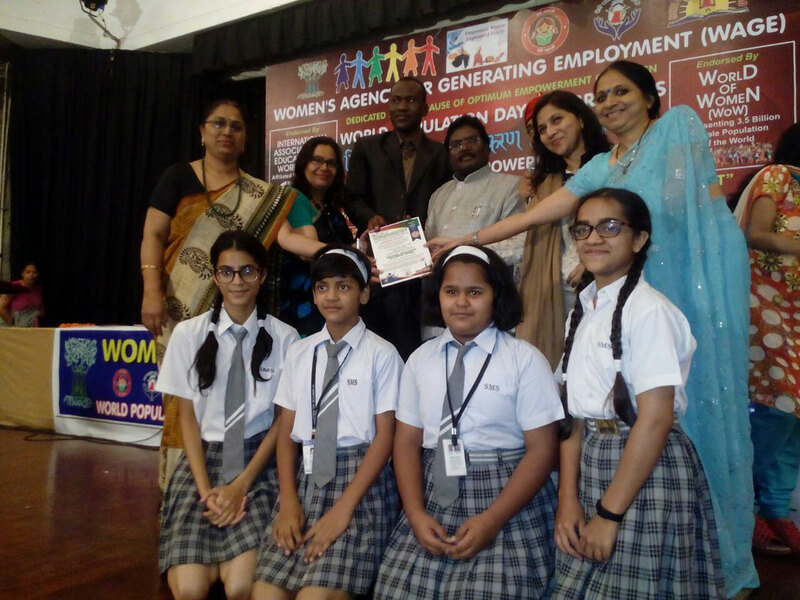 2017 World Women Empowerment Summit International agency constituted by International Association of Educators of World Peace (AEWD) ,affiliated with United Nation – ECOSOC, UNESCO & UNICEFconferred the “National Population Education“ award to our school Principal – Ms. Alka Kher and other teachers Ms. Deepa Hurary, Poonam Bhatia, Ms. Archana Puri, Ms. Archana Tyagi & Ms. Monika Uppal for their contribution towards education, skilling and empowering the women and girl child. 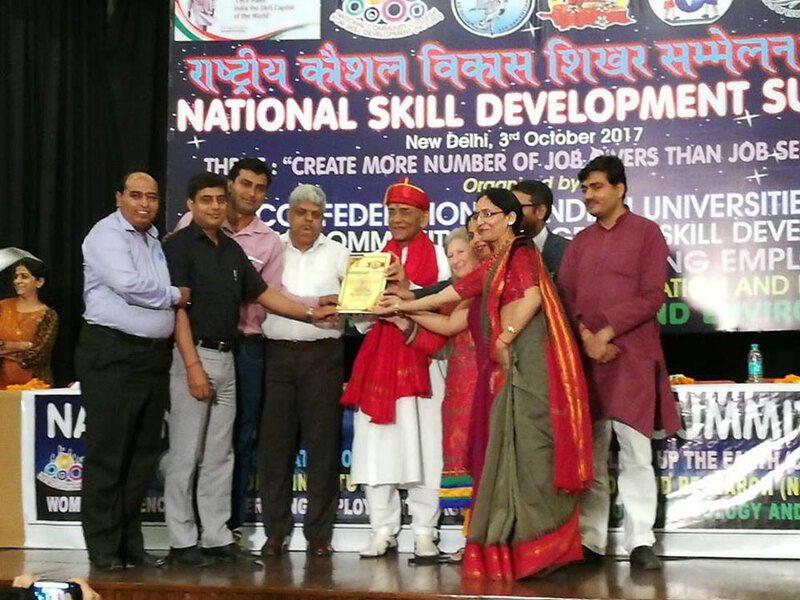 Our school Principal Mrs. Alka Kher and teachers Mr. Manoj Kumar Misha, Mr. A. P. Dubey, Mr. Yogesh Kaushik, Ms. Anjana Varma and Ms. Divya Dwivedi were conferred "Skill Centric School Education Award" during the National Skill Development Summit held at India International Centre, Lodi Estate, New Delhi. 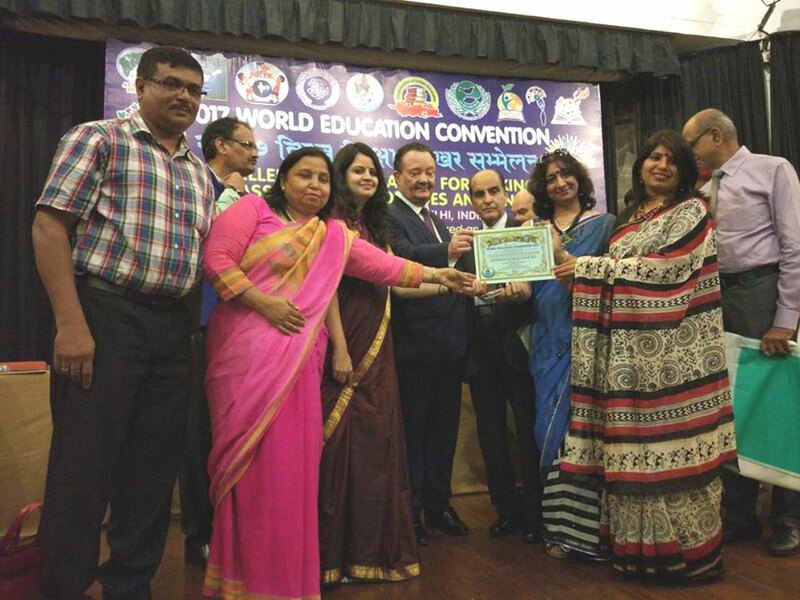 "The World School Excellence Award 2017' was conferred to our school during World Education Convention 2017. 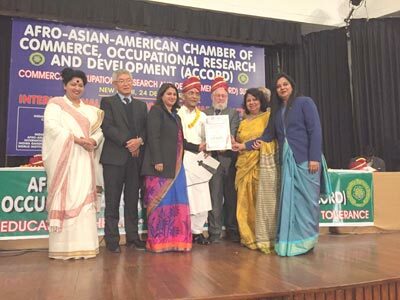 Along with Ms. Alka Kher, Principal, the award was conferred to Ms. Niru Sabharwal, Ms. Neetu Chawla, Ms. Rajni Bhalla, Ms. Jyoti Sachdeva and Mr. Mohan V. Thomas. The GVC Secondary Team of our school won Gold Award in the Global Virtual Classroom web-designing contest 2016-17 supported and sponsored by Give Something Back International (GSBI), Dallas, USA for their website ‘21st Century Skills’. 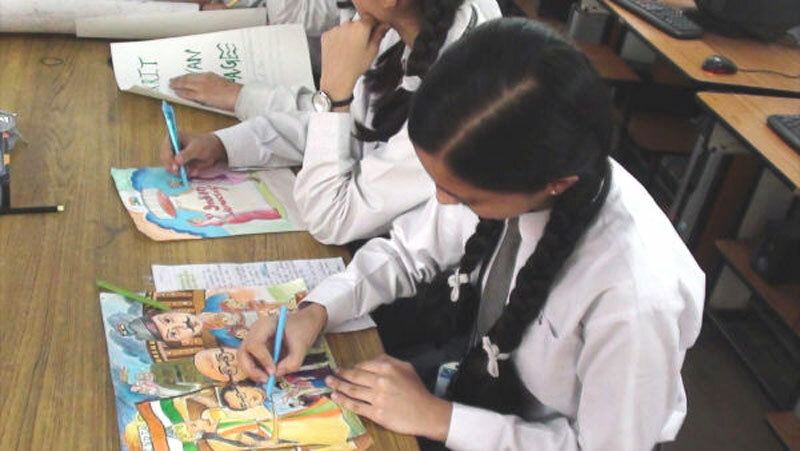 The students used both research work and the arts to explore – 21st Century skills and thus exhibited creativity and collaboration in their work working in collaboration with Tajrobawi Girls High School, Afghanistan. The team was awarded Monetary Award Cheque and one year scholarship to educate a disadvantaged student for their outstanding accomplishments. 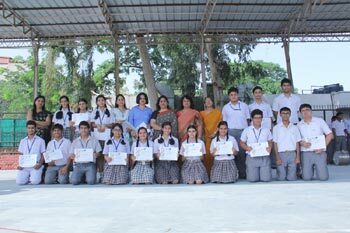 All the participants and the teacher coordinator were awarded with a Gold Award Certificate and a letter of appreciation for the Teacher Coordinator Ms. Monika Uppal. 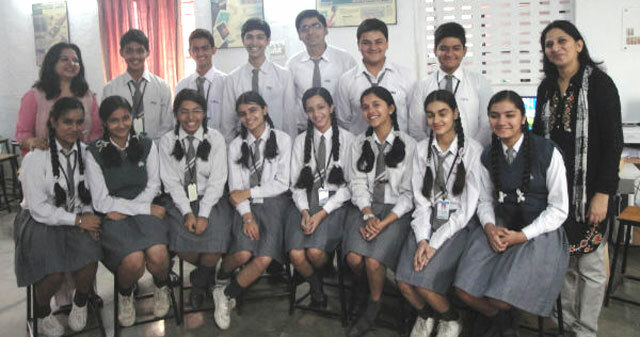 The team comprised of students from Classes IX- XI. 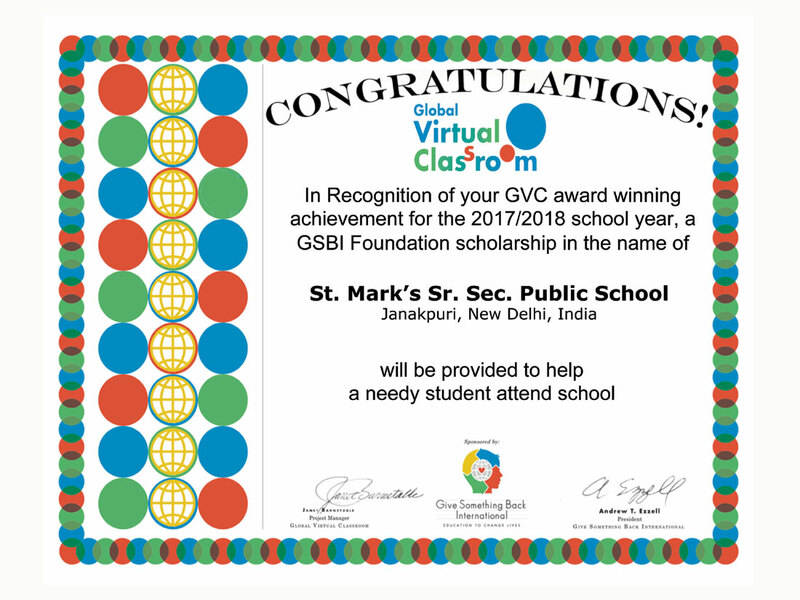 The result of the online project GVC-1506 (Primary group) for Classes V-VIII and GVC-1507 (preprimary group) for Classes I and II that was held from September 2015 to March 2016 was recently announced. The topic for GVC-1506 was ‘Nurturing the Myriad Greens’. The team was awarded ‘Special Merit-Exceptional Creativity’ for designing outstanding website. The topic for GVC-1507 was ‘Cultural Connections’. The team was awarded ‘Special Merit -Exceptional Collaboration and Creativity’ for their outstanding work. 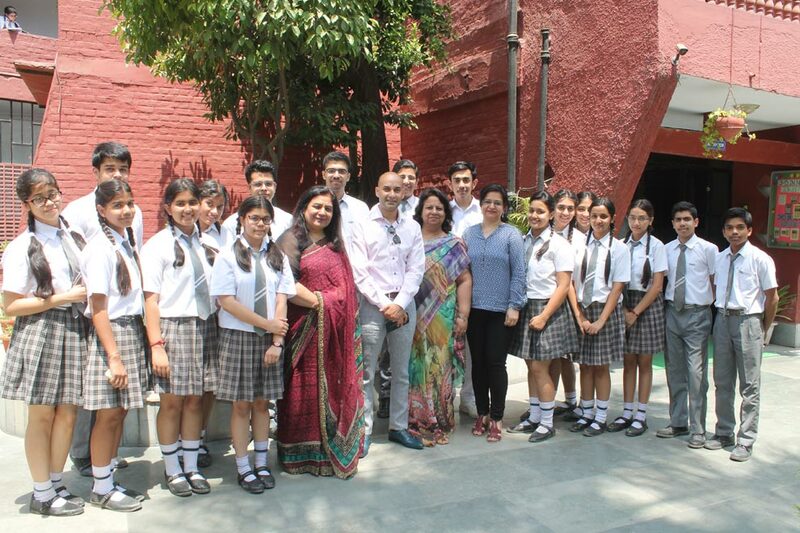 The students were guided by the Project Coordinators Ms. Inderpreet Kaur Ahluwalia and Ms. Ritu Khurana. 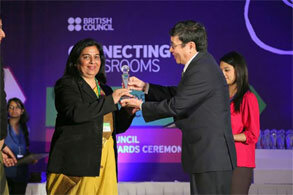 Ms. Versha Gupta was associated as the Technical Advisor. 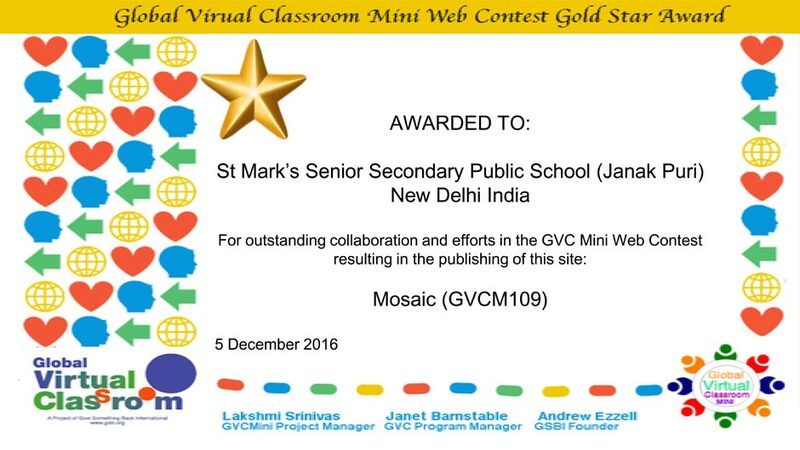 Congratulations to the Secondary Team of our school for getting Gold Star Award for designing the website ‘MOSAIC’ working in collaboration with Meadowcreek High School, USA in the inaugural round of Mini GVC Contest – 2016. It was a 10 week contest which lasted from August 5 to November 25 2016. 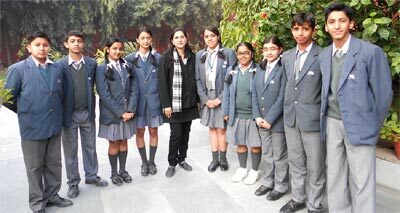 The team of our school was headed by the GVC Project coordinator Ms. Monika Uppal. 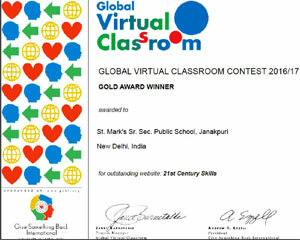 A Gold Star Certificate was awarded to the school and a badge for the school website. 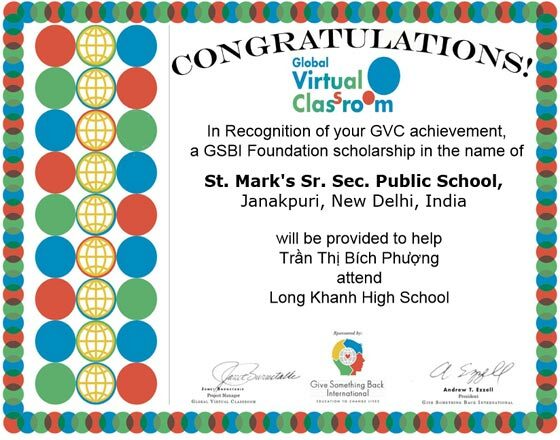 The participants and the teacherIn charge were awarded with a Gold Award Certificate.In addition to that Give Something Back International Foundation, who sponsor GVC has provided sponsorship certificate for a child in Vietnam on behalf of our school. 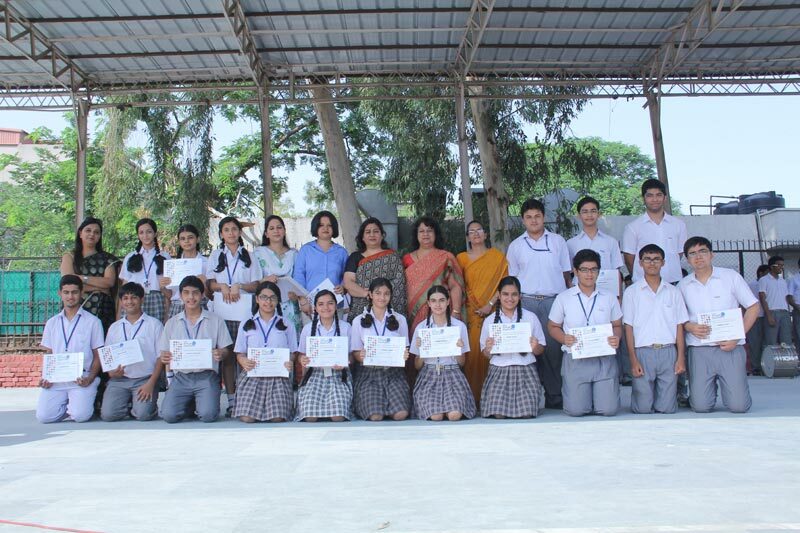 The Secondary Team comprising of 18 students from classes IX - X of St.Mark’s Sr. Sec. 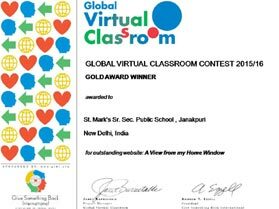 Public School, Janakpuri once again won the Gold Award for their website “A view from ‘My Home Window’ designed by them in the Global Virtual Classroom contest. 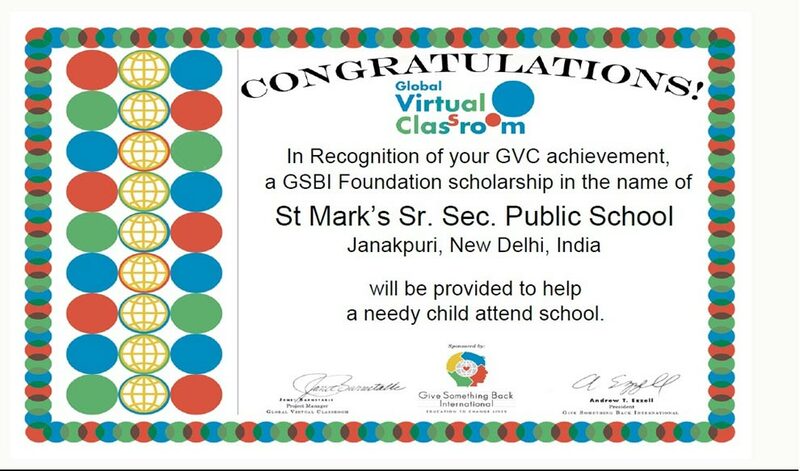 This contest was supported and sponsored by ‘Give something back International’ (GSBI). The students exhibited creativity, collaboration, beautiful visuals & innovative use of technology in their website. 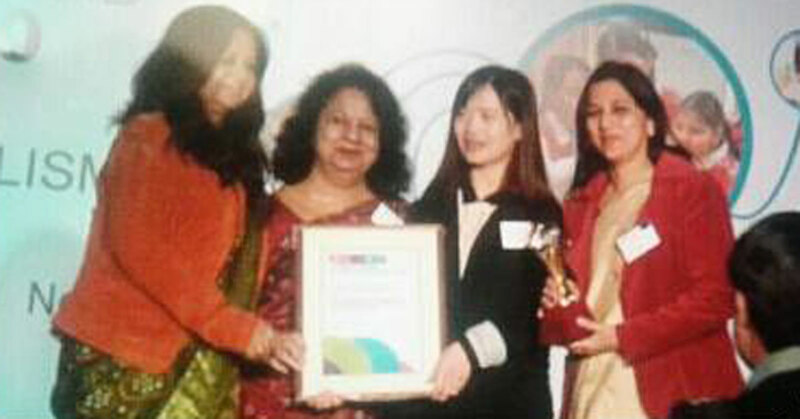 The team was awarded a plaque, M.A. C and one year scholarship. The participants and the Incharge were awarded with a Gold Award Certificate & a letter of appreciation for the teacher coordinator Ms. Monika Uppal. A moment to cherish . . . . . . 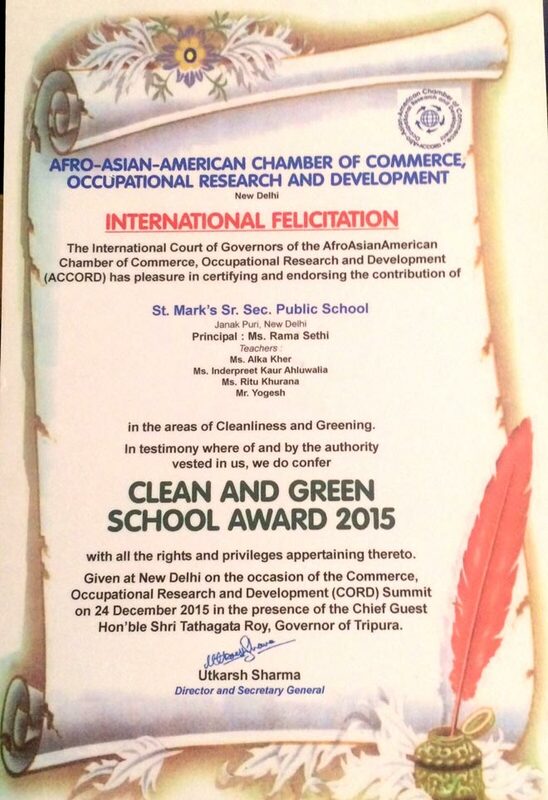 The International court of Governors of the Afro-Asian American Chamber of Commerce, Occupational Research and Development (ACCORD) endorsed the contribution of our school in the areas of cleanliness and Greening and conferred our institution with the ‘Clean and Green School Award 2015’. 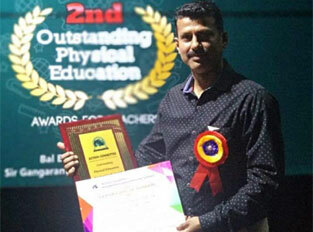 It was a moment of proud for our esteemed institution. 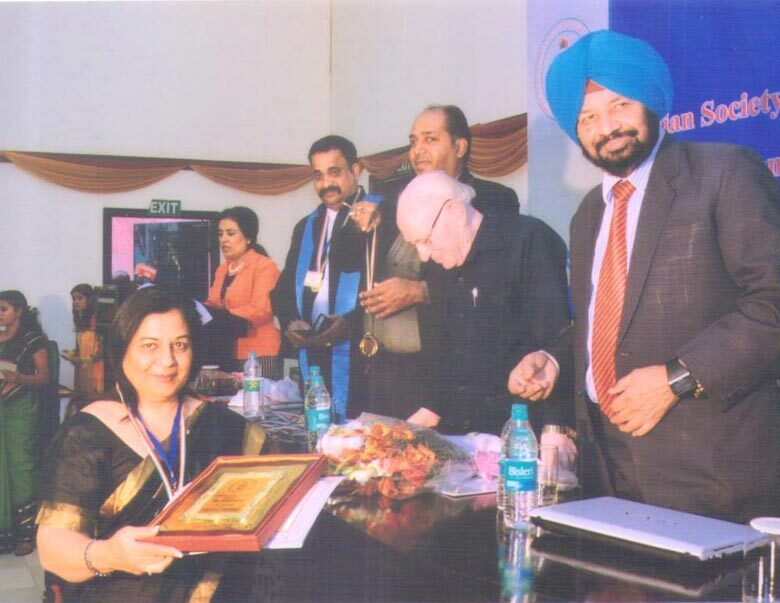 Making a mark . . . . . .
Ms. Rama Sethi, Principal – St. Mark’s Sr. Sec. 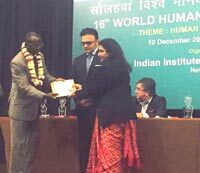 Public School, Janakpuri was conferred with the coveted 2015 Global Human Rights Protection Award for her exceptional work in promoting a culture of respect for Human Rights amongst school students and teachers by the Indian Institute of Human Rights (16th World Human Rights Congress). A Feather in the cap . . .
St. Mark’s Sr. Sec. Public School, Janakpuri won Grand Prize in the Secondary School Category this year in the Global Virtual Classroom web-designing contest supported and sponsored by Give Something Back International (GSBI), Dallas, USA for their website ‘Rhyme & Rhythm’. 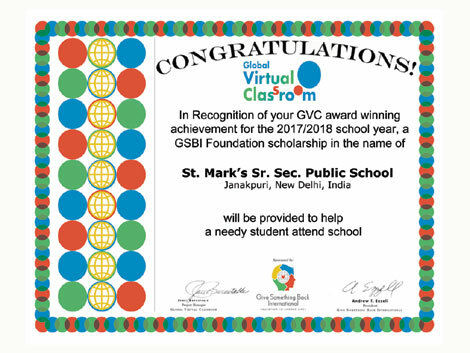 GSBI is a free educational website building activity that aspires to enable, empower and connect students around the world by integrating technology into classrooms. The Team were awarded a plaque, Monetory Award Cheque and one year scholarship to educate a disadvantaged student for their outstanding accomplishments. All the participants and the teacher coordinator were awarded with a Gold Award Certificate and a letter of appreciation for the Teacher Coordinator Ms. Monika Uppal. The students demonstrated creativity, collaboration , helping focus and innovative use of technology in their work and created an outstanding website. 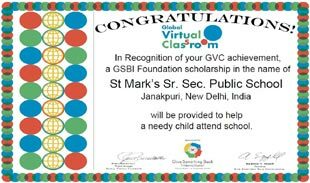 To promote Global citizenship, nurture the students & to strengthen the International dimensions, the teachers & students of St. Mark’s Sr. Sec. 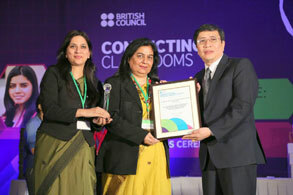 Public School, Janakpuri got engaged with the ‘British Council International School Award’ Programme in the year 2013 - 2014. This journey completed in March 2014 and met the required standards. The school is accredited with the “British Council International School Award” for the period of 2014 - 2017. The Principal - Ms. Rama Sethi, the teacher co-ordinator - Ms. Archana Tyagi alongwith 12 members of the ISA Team were awarded certificates and a trophy. The coveted trophy was awarded in the Annual British Council School Awards Ceremony held at Hotel Kempinski Ambience on 4 December 2014. The learning journey for the teachers & the students was the biggest reward of ISA. 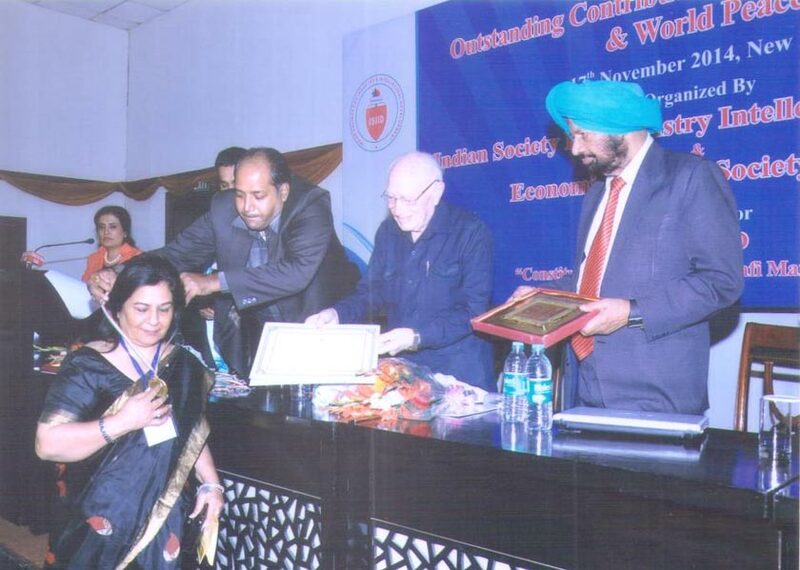 Indian Society for Industry & Intellectual Development honoured Ms. Rama Sethi, Principal St. Mark’s Sr. Sec. 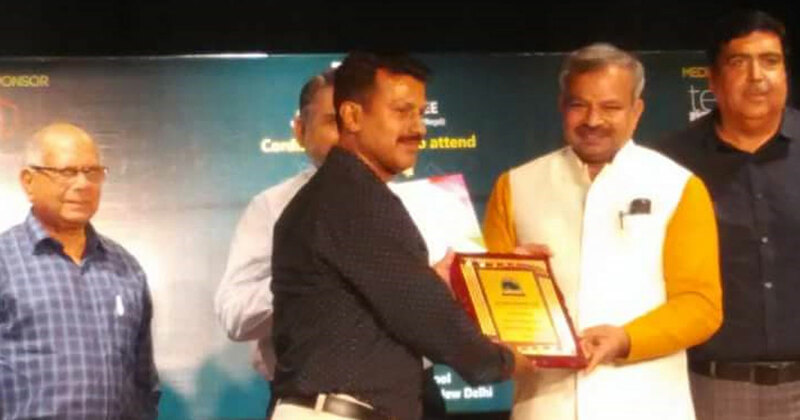 Public School, Janak Puri, with “RASHTRIYA SHIKSHA RATAN AWARD” in recognition of sterling Merit Excellent Performance and outstanding contribution for the progress of the nation & worldwide on 17th November 2014 at Speaker Hall, Rafi Marg, New Delhi. GVC - Global Virtual Classroom - an online collaboration learning project that fosters creativity, cross cultural understanding, helping others and teachers, IT and website design skills amongst students working together from around the world. Contest participants virtually collaborated with students in other countries to build and submit website designed around a prarocative theme. 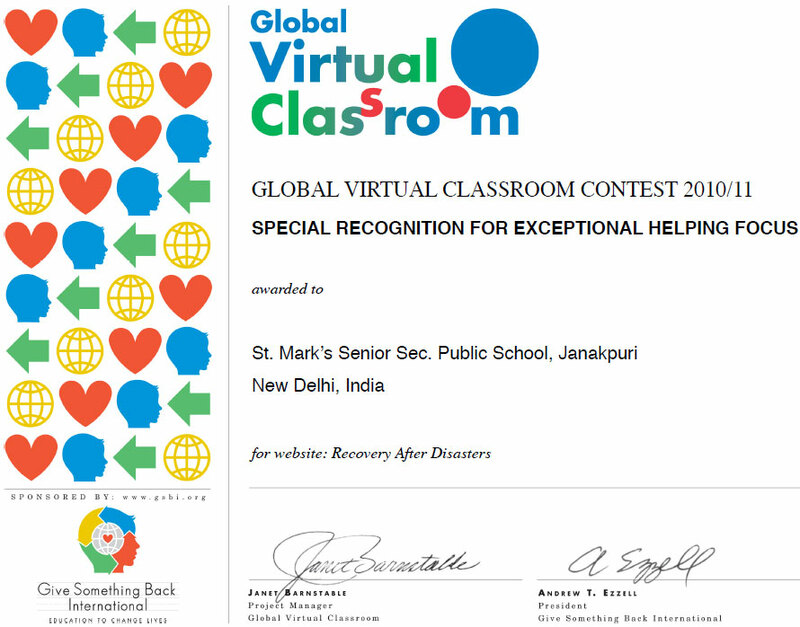 The primary team of our school along with our partner schools - Edgewood Elementary School, USA and Vozhensenskaya School, Russia won the special merit award for exceptional creativity. Our topic was ‘Holidays Around the World’. GVC Secondary Team got a merit award for Exceptional Collaboration for their site “Friendship Beyond Culture”. 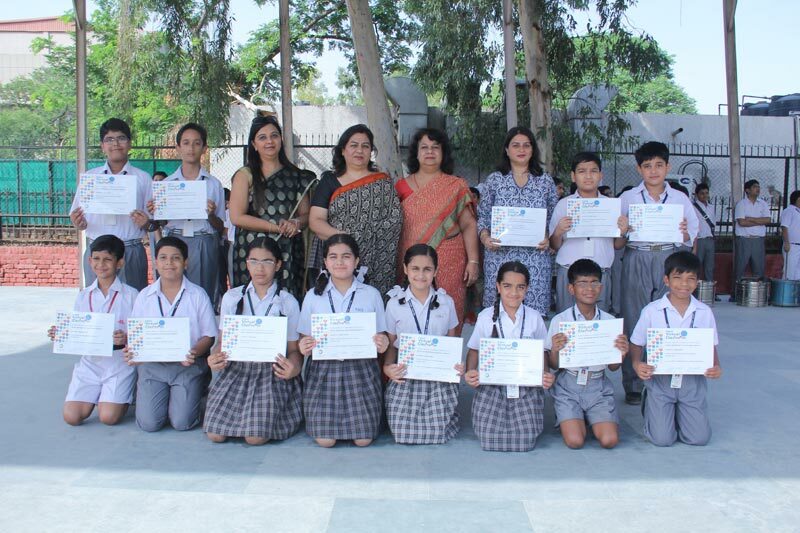 The students worked in collaboration with Russia, Spain and got a participation certificate along with the teacher coordinators Ms. Monika Uppal and Ms. Rosy Marwah. 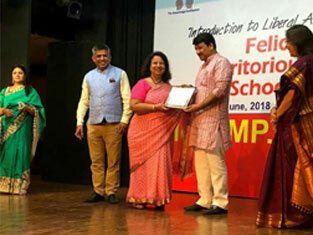 The school was awarded with a Merit Certificate. 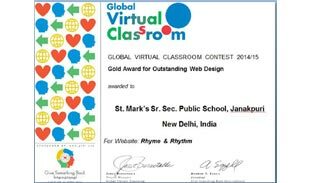 The Primary Team of GVC too won a Merit Award for ‘Special Recognition for Academic Excellence’ for their Website ‘Countries Comparison‘. 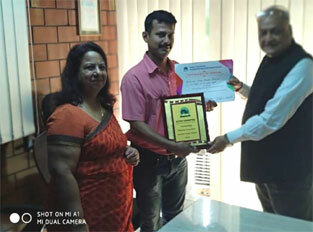 A Software - ‘Pixie and Frames to your Classroom’ was given as a token of appreciation. 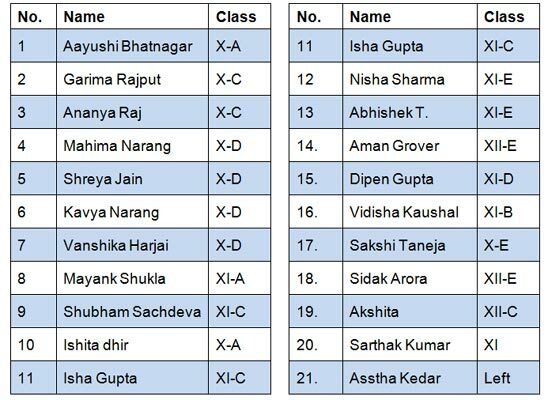 Abhishek Panda (IV-A), Shreshth Saxena (IV-A), Mishti Arya (IV-F), Ayushi Jain (IV-F), Meenakshi (V-B), Aditya Goel (V-B), Vani Banga (V-B), Jayati Garg (V-D), Aryan Dua (V-C), Aniket Goyal (V-C), Aniket Pandey (V-C), Dishita Gupta (V-F), Mayank Narang (V-E), Bhoomi Chawla (V-A), Parth Madaan (V-A). 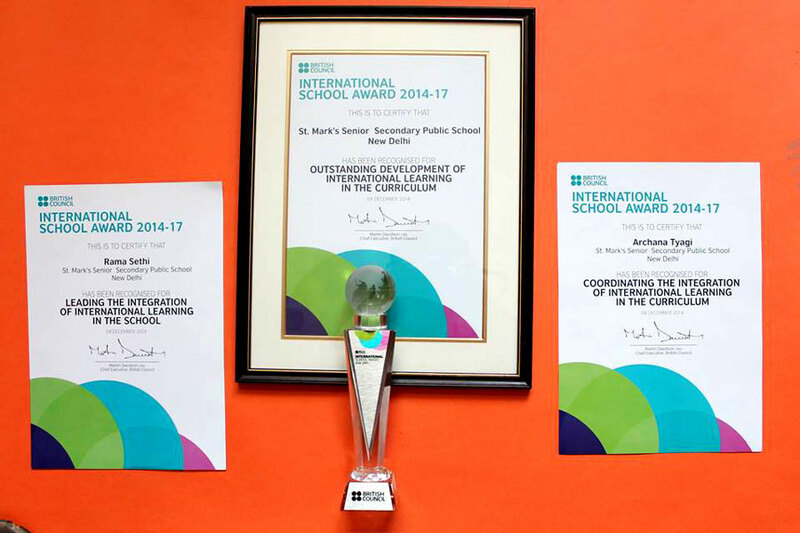 The Secondary Team of our school won a Merit Award for ‘Exceptional Collaboration’ and ‘Exceptional Helping Focus’. 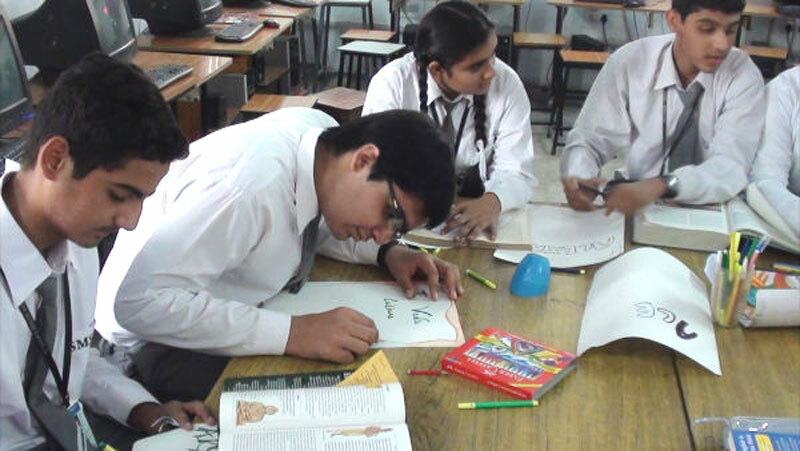 Students have been working diligently on various beneficial online learning projects under AEC-NET. This year AEC Gold Award was awarded to the AEC Project Group for the project ‘A Magic Flight to Berlin’. 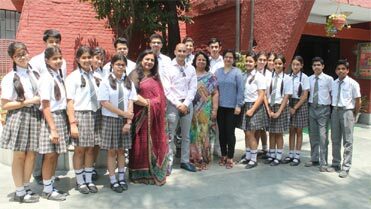 Our students worked in consonance with their peers from Germany, Indonesia, Italy, Mongolia, Spain, Sweden, Portugal, Poland, Philippines and five other schools of India. 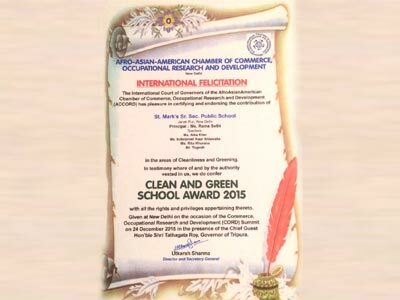 The AEC Project Group also bagged ‘Merit Award’ for the project ‘Go Cyber Green’ where the students worked on various projects in collaboration with schools from Ireland, Malaysia, Portugal and India. 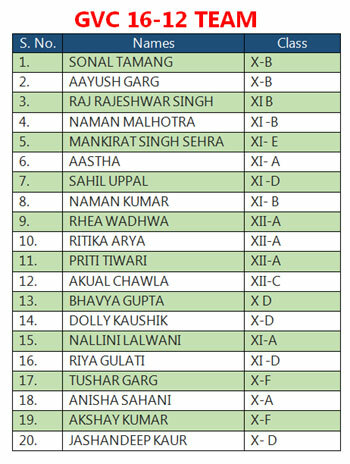 This is the second year of participation of our school in this contest at Secondary Level. Our school team comprising of 17 students from classes IX-XI along with the students of USA and CROATIA (our other two team members) created a website on the topic ‘GLOCAL CULTURAL HERITAGE’. Throughout the contest the students from all the three countries worked in close coordination to build a website that best meet the contest objectives. (1) Endangered & Extinct Animal around the world. (2) Glocal Cultural Heritage – Secondary level. Kudos to the GVC-10-13 Team! 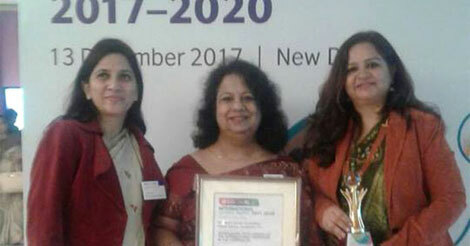 And the teacher co-ordinators Ms. Archana Tyagi and Ms. Monika Uppal for receiving the Helping Focus Merit Award for their site - “Recovery After Disaster”. Kindly click on the site to see the work of the students (Year 2010-11) : http://gvchelping.blogspot.com. AEC Online Global Projects for the session 2011-12 were started with Greece, Singapore, Sweden and Ireland. 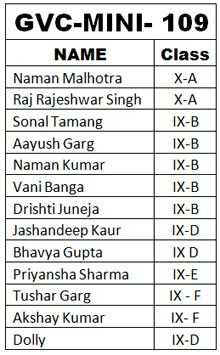 The creative output of the students was appreciated for their project “Opps Apps” under the Video making competition and gor I Position in the category of “Present your Country” & II Position “In the School Life and Sports Category”. The group of students of Class V of our school are actively participating in Asia Europe Classroom (AEC) project titled “Teddy Travels”. We are collaborating with schools from Spain and Czech Republic. 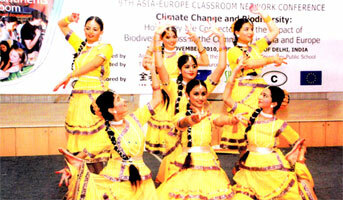 This project aims at understanding cultures of other countries. 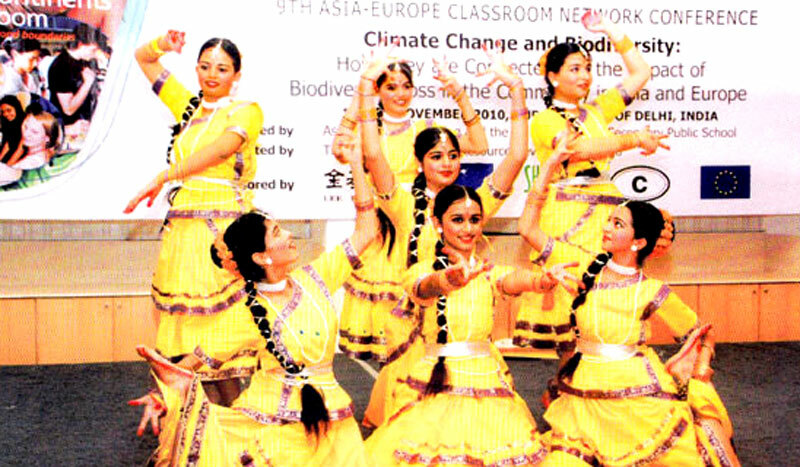 Interlinking of European and Asian countries for educational exchanges in future is both timely and need hence forth. This need to evolve by balancing strategic and achieving knows how’s which leads to goals which present generations need to pursue to achieve new heights. Under the aegis of “AEC-NET” Asia Europe Foundation, St. Mark’s School Meera Bagh organized a conference for high School teachers and educators from Asia and Europe at Hotel Lemon Tree - Gurgaon from 12th to 16th November 2010 to encourage and develop online collaborative learning projects involving groups of teachers and students. Our school was represented by Mrs. Archana Tyagi and Mrs. Sunita Hakku. The key objectives of this programme were collaborative cross cultural learing exchanges among ASEM countries. 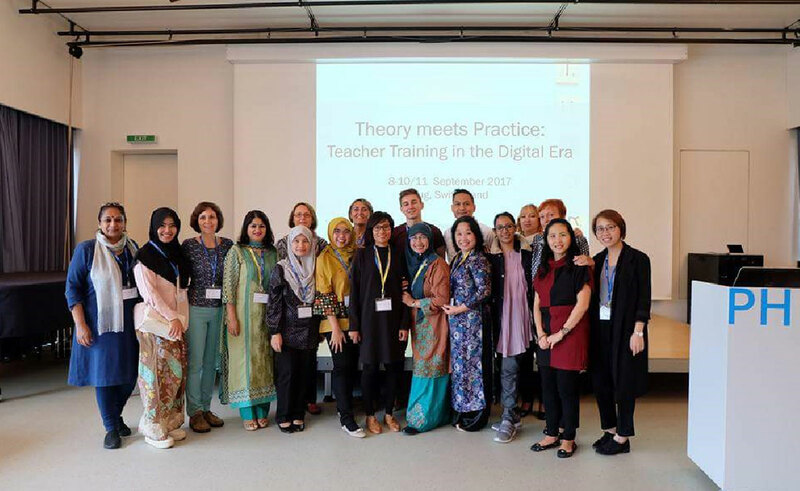 The main aim was to encourage use of info communication technology (ICT) to develop innovative and interactive platforms for enhancing inter cultural learning opportunities therby opening the global doors beyond learning in the classroom.